There was outrageous and incredibly frightening turbulence on my Cathay Pacific flight back to JFK from Vancouver. When it was all over, my heart was pounding and I was just happy to be alive. I decided to turn on a movie to calm myself down even though there was less than two hours left in the flight. 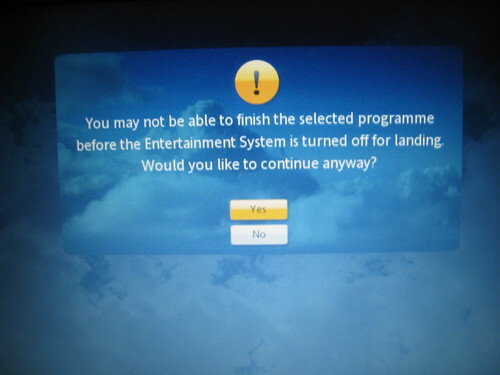 You may not be able to finish the selected programme before the Entertainment System is turned off for landing. Would you like to continue anyway? There are many systems that would just play the movie and cut you off at the end with no warning. I loved that it did the math for me ahead of time and let me know what to expect, but also that I could play the movie anyway. I had chosen a movie I’d seen many, many times before and I really didn’t mind missing the end. This is a great example of appropriately setting your users’ expectations and giving them the control they deserve. A system doesn’t have to be a genius and try to read people’s minds. Just do some simple math and put the choice in your users’ hands. Very considerate, though our surprise at this somewhat simple inclusion to a piece of software only serves to illustrate how lacklustre alot of the UX's we have/encounter on a daily basis actually are. still – its a nice touch. That is a great example of applying a little extra thought outside the basic scope of choose movie -> play. Nice random find.